I have a lot to recommend having a Tech II clone for DIY work on our cars. For the way that you are going to be using the Tech II clone, your going to be fine with it. As for why GM is going to the GM MDI and a GDS2, instead of using a Tech II with TIS2000 software, it because the MDI with GDS2 flashes a hell of lot faster when you have flash a new module with either it orginal firmware or upgraded firmware. Its also faster to use than having to press buttons on the Tech II for basic commands during diagnostics as well. So in regards to the vets, Tech II clone will cover all the Chevrolet Corvette C6 cars and older since the last of the updated firmware on the unit covers from here back. If you do need to reflash something, it's done via Tis2000 with the Tech II as the pass through device. On a Chevrolet Corvette C7, since GM did not make upgraded firmware to flash into the Tech II's to cover these cars, then it's a MDI that is needed instead. As for the MDI's firmware, they will cover no only the new cars, but the cars that the old Tech II's used to cover as well. Now the glitch on the MDI regarding cloning it, since it has to use the GDS2 software for the pass through only device, GDS2 software has not been cracked like Tis2000 software has been isntead. 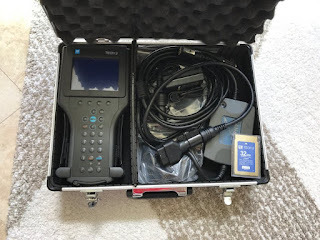 Hence the Clone Tech II unit you get will already be loaded with the most current firmware, and for most of the stuff you going to use the Tech II clone, will just be using the unit by itself without being connected to a lap top. Do not worry about what version of windows you are running. Hence if you are running win 10, and the software needs to run on wp, then you can runs something like VM player (free) to vm XP on the machine to run under that shell. Hell the cracked version of Tis2000 will come with VM player to begin with. So the Cracked TIS200 disc first installs VM player to your machine with a XP shell, then installs Tis2000 to that shell when you install the disc. So when you start the cracked TIS200 program after loading the disc, it first loads the VM player software, then opens TIS2000 in that VM player running in XP, on your win 10 machine. As for a cracked version of GDS2 and all the other software needed as well like Tis2web), if someone has skinned that cat, and it will work with a GM MDI II clone, then it just a mater of time before they hit the market as well. Hence with the Tech II since it preflashed with 33.004 firmware , it does not have to be connected to a PC for 99% of what is going to be use for. Since the Mdi II is PC driving only, then you get into the can of worms with all the needed Software cracked so you don't have to web connect to GM to run the software instead. Quick way of how GDS2 works, with having to renew the software lease every 14 days, and also needing a SPS subscription to reflash as well. Really to sum it up, since the clone Tech II work on the c6 vets, we have lucked out that the clone units are dirt cheap now. 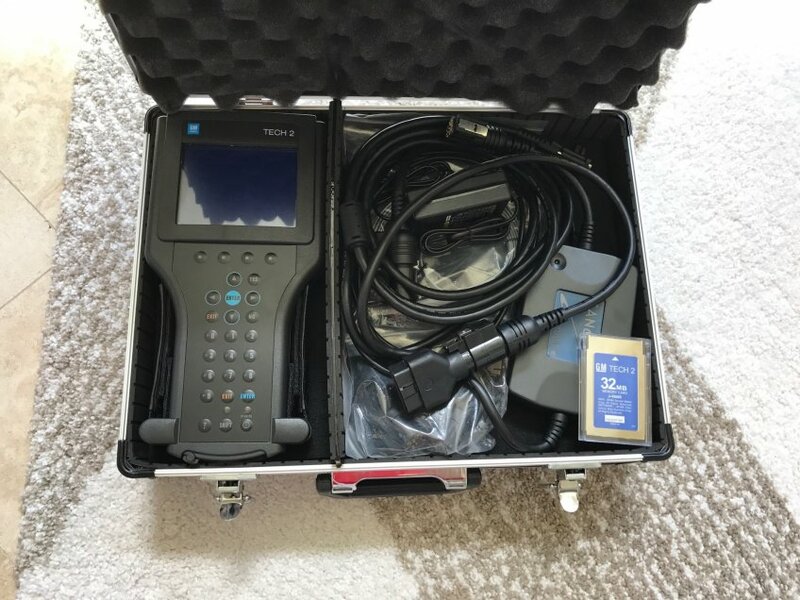 Its the C7 guys that are now having to play the waiting game to get their hands on a Working cloned MDI 2 with all its needed cracked software so they are not being raped by the dealers ever time the tool is needed. Hence just like the C6, the C7 has a pump in the ABS system that needs to be cycled via the tool every time you bleed the brakes to flush the old fluid (and air if the systemwhen dry) out every few years, and although there are other tools that can be used to do such instead, none of them are currently cheap instead. Hell, with a clone Tech II going for around $200, if you did the inflation math of when you used to have to buy a timing light for tuning a engine of the old of say pre 90's, pretty much about the same price; while the Tech II doing so much more instead. Plus when you go to sell the vet in a private party sale, having a Tech II to go with the car is a huge selling factor as well; so your really not out of money in the end no mater how you look at it buying one . The way I look at it, the vet should have come with not only a Tech II to being with, but also a battery tender and TPMS reset tool as well. Think about that, since most cars today will still display codes on the dash if it has problems (no scanner needed), while on the vet it will not. C5 you could a magnet to reset the TPMS, while on the C6 you can not. And battery drain when the car sits for days/weeks, hell the C6 should of had a plug in port with a built in tender on the car as well. Last edited by Dano523; 12-13-2017 at 09:13 AM. Q: Please can you tell me how to update Diatronik SRS+DASH+CALC+EPS OBD Tool ? A: Diatronik key update help. Here you go. The update query can be stored in a file (button [To file]), copied with the button [To clipboard] or sent as email to developer ([mail]). Archive the text file with results using your GCT serial # as file name and email it to developer. The update program can be closed at this stage. Wait for response email from the developer. When generating the update data and during firmware update the key performs a series of checks on key options (ID, Shared code, and some others). This excludes the possibility of substitution of the key. You must then run the client update utility again and select “Resume previously started remote update session”, then click [Next] button. Next steps are only needed when the update key is in fact the firmware or image template. If the update was performed based on data of the image file, then step 3 is the final stage of the upgrade. In the process of updating the key memory client utility will generate the final code-confirmation containing information about the updates (successfull/unsuccessfull). Code-confirmation is to be saved (button [To file]) or copied [To clipboard], renamed using your serial # as file name and sent to developer of the application by any convenient way (email, PM, Skype: moe03071 ). Crdits to Moe who share all above with us. 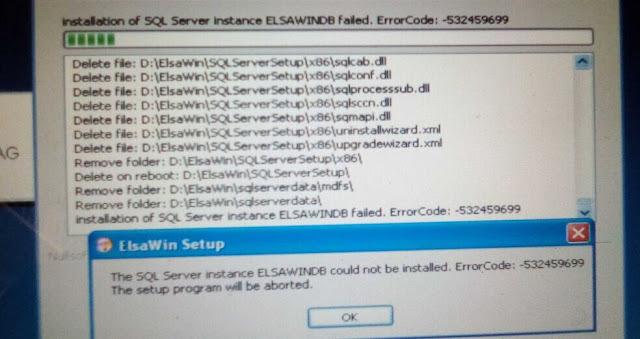 Here are customer solutions of Elsawin install failure with error message “The SQL Server instace ELSAWINDB could not be installed” with different error codes. Make sure .NET Framework 3.5 (includes .NET 2.0 and 3.0) box is checked (Check every box inside it). Purpose: This log is the clean and user friendly log file that contains the basic information about the problem. This file shows which SQL server components were detected, the operating system environment, the command-line parameters that were specified, the values that were specified, and the overall status of each MSI and MSP file that was executed. Troubleshooting: To find errors in this file, search for “error” or “failed” keywords. For more information about details of the failure, open the file that is listed in the line starting with “Log with failure”. Another version of Microsoft Visual Studio 2008 has been detected on this system that must be updated to SP1. Please update all Visual Studio 2008 installations to SP1 level, by visiting Microsoft Update. ElsaWin is the official Windows Software for servicing Audi and VW cars globally. Due to Windows 8 and 10, 32-bit and 64-bit versions, sometimes we don’t get them to install correctly or having problems installing them. For 64-bit version of Windows 8 and 10 (most of newer computer or laptops), the only ElsaWin that support are versions 4 or newer. The current one now is 5.2 which includes some of the 2016 models. ElsaWin requires .NET Framework 2.0, 3.0 and 3.5 to work. Windows 8 & 10 use .NET Framework 4.x but they also have the options can be turn on in “Turn Windows features on or off” in Control Panel/Programs and Features. If you don’t have these enabled correctly, we should get Error Code: -2068025713 ELSAWINDB could not be installed. Elsawin Version 4.0 and 4.1 update should not have any problems installing first regardless, but most of the problems exist in the version 5.0 update when the SQL 2008 is installed. Windows 10 will give warning that the SQL 2008 may not be compatible, but it won’t stop the installation if everything is update correctly.